Huge Saving. This iconic piece, made from solid granite, looks fantastic and will easily impress friends and relatives. This makes our pestle and mortar very durable and makes it the best way to grind both hard and soft ingredients. Beautiful and Durable The VonShef Mortar and Pestle is the perfect accompaniment for any kitchen. This iconic piece, made from solid granite, looks fantastic and will easily impress friends and relatives. The toughness of granite is due to the interlocking crystal structure as it cools from melt, making it amongst the hardest of rocks. This makes our pestle and mortar very durable and makes it the best way to grind both hard and soft ingredients. Create Delicious Dishes The time for buying pre-made and pre-packaged pastes, pestos and dressings is over. 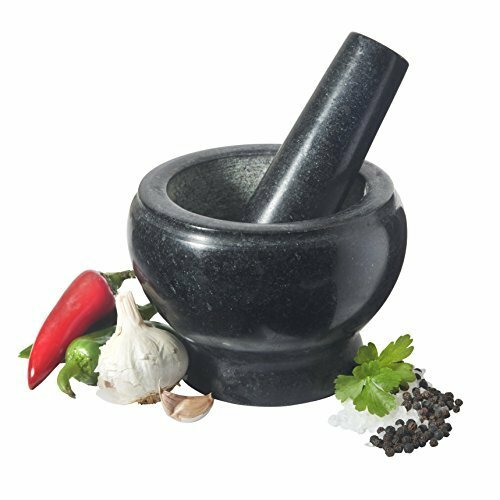 The pestle and mortar allows you to grind the freshest of herbs to create the most fragrant of pestos; and the toughest of seeds and spices to create the most aromatic of curry pastes. Making your dishes from scratch will take them to the next level, so impress all your friends and family. The Dimensions Height: 4", Outer Diameter: 5.5", Grinding Area: 3.75" WEIGHT: 6.7 pounds *IMPORTANT* CARE INSTRUCTIONS Like a lot of high quality cookware items made from granite, 5 minutes preparing the item for use before will 'season' it for future use and ensure that it lasts a long time. To do this, simply wash the pestle and mortar in warm water, using a brush to remove any granite particles and leave it to air dry. Then, briefly grind a handful of rice, remove and discard and then wash again. This procedure will ensure that you can enjoy the VonShef Mortar and Pestle for many years to come!